The U.S. election is nearly here -- and brokerage houses are fastening their seatbelts in case things get a little bumpy. Several retail brokerages are jacking up how much cash investors need to pony up to trade certain currencies, gold, and some stock market futures contracts ahead of the elections. FXOpen recently alerted clients that starting on November 3 it may temporarily increase "margin requirements" to up to five times their normal level. By temporarily raising so-called "margin requirements," brokers are requiring investors to put down more money to cover possible losses on risky trades made with borrowed money. 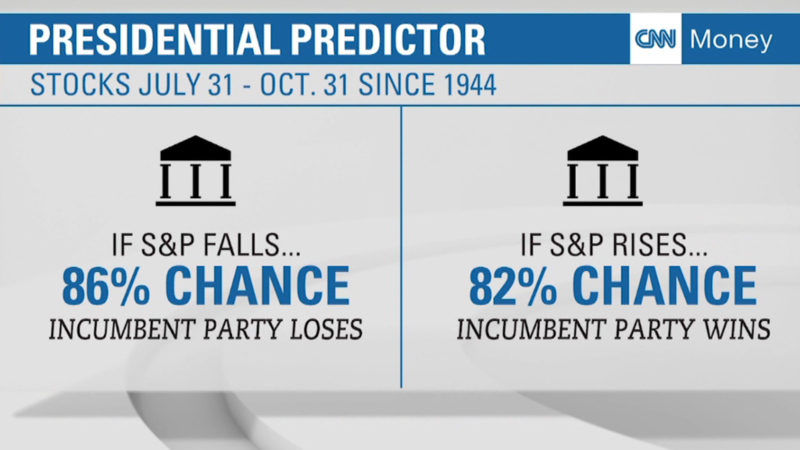 The moves are a sign that trading houses are bracing for election-related volatility. That's especially true for currency trading firms, many of which have announced the precautionary step -- particularly for bets involving the Mexican peso. FXCM, a currency trading broker, said it has almost doubled the requirement for Mexican peso trades. Why specifically the Mexican peso? That's because the peso has moved like a ping pong ball lately based on Donald Trump's chances of winning the White House. Trump's tough talk on trade with Mexico and push to build a wall between the two countries means the election could have a pronounced impact on that country's economy, and thus its currency. The peso has moved up when the likelihood of Trump being elected goes down, and vice versa. For instance, it fell more than 1% on Tuesday as new polls showed the presidential race tightening. A lot of currencies are traded on borrowed money. That means when the value of currencies drop or increase dramatically, big losses can occur. That's what happened at FXCM (FXCM) and other brokers in early 2015 when the Swiss franc skyrocketed suddenly after Switzerland's central bank unexpectedly removed its peg to the U.S. dollar. The move sparked huge losses for FXCM customers -- and forced the firm to secure an emergency loan to cover its own losses. To prepare this time around, FXCM said it will temporarily double the margin requirement on 18 currency pairs starting on Friday at 5 p.m. ET. The firm said it will lower margin requirements "as soon as market conditions allow." Brokers are trying to avoid being left on the hook to cover for investors who get wiped out by crashing currencies. Some brokers similarly prepared for the Brexit vote in the U.K., which also resulted in the pound moving wildly after the shocking referendum. Lee Hardman, a currency analyst at Bank of Tokyo-Mitsubishi UFJ, warned in a recent note that there is "plenty of scope" for more foreign exchange moves if Clinton's support slips in the polls. "The market is pricing in very little risk of Donald Trump becoming president," Hardman wrote. Last week, brokerage firm Saxo Bank margin requirements are going up on most major currency pairs, including the the Russian ruble and the peso. "There is no doubt that a surprise outcome of the election can create strong volatility," Claus Nielsen, head of markets at Saxo Bank, said in a statement. "It is important for us to emphasize that neither Saxo nor our clients benefit from overleveraging." It's not just currencies. Interactive Brokers (IBKR) told CNNMoney it has raised margin requirements on the VIX (VIX) volatility index and similar investments that are "unusually sensitive to event risk." Saxo Bank said it has also raised margin requirements on certain equity and fixed income products. Likewise, FXCM ramped up margin requirements on some gold and stock market futures contracts it sells to non-U.S. investors. TD Ameritrade (AMTD), which caters to a wider audience of investors, raised margin requirements before Brexit but has not done so this time around, nor has Charles Schwab (SCHW), at least not yet. "We're always monitoring risk. We could change if we had to," TD Ameritrade chief market strategist J.J. Kinahan told CNNMoney.